Since the last weekly update three weeks ago investment markets have been on a bit of a roller coaster ride, with Santa missing Christmas for markets but arriving the day after. Global shares led by the US continued to plunge into Christmas as the US saw the start of a partial government shutdown taking the decline in the US share market to 19.8% from its September high. But since Christmas share markets have rebounded, credit spreads have narrowed and the $US has fallen as investors have become a bit less nervous about the outlook helped by a more dovish Fed, signs of progress on the US/China trade issue and maybe a bit of Christmas/New Year cheer. The past week has seen shares continue to rally, government bond yields decline, oil and the iron ore price move higher and the $US fall which has seen the $A push higher. While the recent rebound in share markets has come on good breadth (ie strong participation across sectors and stocks) and is confirmed by other markets like credit and a rally in “risk on” currencies it’s too early to say that we have seen the lows. Global growth indicators look like they could still slow further in the short term and there are a bunch of issues coming up that could trip up markets including US December quarter profit results, US/China trade negotiations, the US government shutdown, the need to raise the US debt ceiling, the Mueller inquiry, Brexit uncertainties, the Australian election, etc. So markets could easily have a retest of the December low or even make new lows in the next few months. First, the US share market has seen six significant share market falls ranging from 14% to 34% since 1984 that have not been associated with recession and saw strong subsequent rebounds. Second, each of these have seen some sort of policy response to help end them and on this front recent indications from the Fed including Fed Chair Powell about being ‘patient, flexible and using all tools to keep the expansion on track’ are consistent with it pausing its interest rate hikes this year, Chinese officials are continuing to signal more policy stimulus including cutting banks’ required reserve ratios and expect the ECB to provide more cheap bank funding. Third, negotiations between the US and China on trade look to be proceeding well although they are still in early stages. China in particular announced more tariff cuts and a commitment to treat foreign firms equally. Fourth, President Trump wants to get re-elected in 2020 so he is motivated to do whatever he can to avoid a protracted bear market and recession and this includes seeking to resolve the trade dispute and ending the partial government shutdown before it causes too much damage. Fifth, while the oil price has bounced off its lows it’s still down 30% from its high taking pressure off inflation and providing a boost to spending power. Finally, a year ago investors were feeling upbeat about 2018 on the back of US tax cuts, stronger synchronised global growth and strong profits and yet 2018 didn’t turn out well. So, it may be a good sign for 2019 from a contrarian perspective that there is now so much uncertainty and caution around. US data was mixed over the last three weeks. Consumer confidence, the ISM business conditions indexes, small business optimism and job openings all fell. And on the strong side, jobs growth in December was much stronger than expected and wages growth continued to edge higher. This mixed data is consistent with the Fed’s more cautious approach. Eurozone unemployment fell to 7.9% in November which is well down from its 2013 high of around 12%. The trouble is that economic confidence slid for the 12th month in a row in December suggesting that growth momentum may be continuing to slow. Which with core inflation stuck at just 1% in December will keep the ECB dovish. Japan saw stronger wages growth, but still not by enough to move the Bank of Japan. Chinese data has been soft. Services conditions PMIs rose slightly in December but manufacturing PMIs fell and this is of greater significance globally. Reflecting the slowdown in China Apple cut its outlook citing slower demand from China. Falling consumer and producer price inflation in China for December is also consistent with slower growth. Reflecting China’s growth slowdown the PBOC cut banks’ required reserve ratio again freeing up more funds for lending. 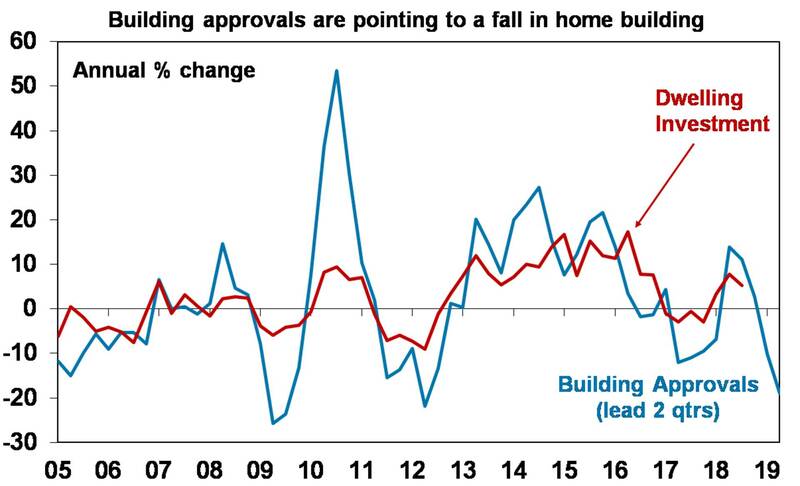 Australian economic data over the last three weeks has been soft with weak housing credit, sharp falls in home prices in December, another plunge in residential building approvals pointing to falling dwelling investment (see chart), continuing weakness in car sales, a loss of momentum in job ads and vacancies and falls in business conditions PMIs for December. Retail sales growth was good in November but is likely to slow as home prices continue to fall. Anecdotal evidence points to a soft December and reports of slowing avocado sales (less demand for smashed avocado on rye?) may be telling us something. Income tax cuts will help support consumer spending, but won’t be enough so it is likely that the RBA will cut the cash rate to 1% this year. 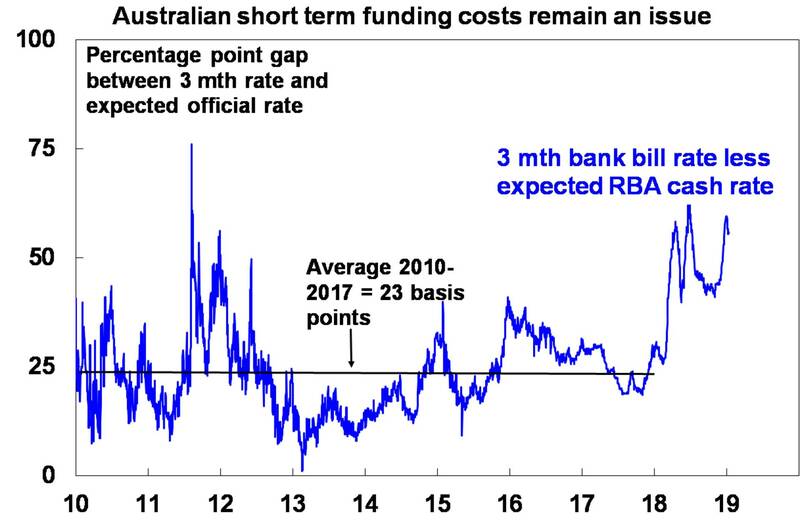 Another blowout in bank funding costs is adding to the pressure for an RBA rate cut. The gap between the 3-month bank bill rate and the expected RBA cash rate has blown out again to around 0.57% compared to a norm of around 0.23%. As a result, some banks have started raising their variable mortgage rates again. This is bad news for households seeing falling house prices. The best way to offset this is for the RBA to cut the cash rate as it drives around 65% of bank funding. In the US, expect to see a solid gain in December retail sales (Wednesday), a slight rise in homebuilder conditions (also Wednesday) but a fall in housing starts (Thursday) and a modest rise in industrial production (Friday). January manufacturing conditions surveys for the New York and Philadelphia regions should show a slight rise and will be watched closely given their plunge last month. US December quarter earnings will start to flow with an 18% yoy rise expected, although the focus will be on corporate guidance with profit growth likely to slow to 5% this year as the corporate tax cut drops out. In the UK, PM May’s Brexit deal faces likely defeat in a parliamentary vote on Tuesday. Even though the UK parliament will force May to come up with a Plan B there is no majority supporting in parliament for any alternative. So the Brexit comedy will continue. A no deal Brexit could knock the UK into recession and maybe knock 0.5% of Eurozone growth. Chinese trade data for December (Monday) is likely to show subdued growth in exports and imports. In Australia, expect declines in both consumer confidence (Wednesday) and housing finance (Thursday). With uncertainty likely to remain high around the Fed, US politics, trade and growth, volatility is likely to remain high in 2019 but ultimately reasonable global growth and still easy global monetary policy should drive better overall returns than in 2018 as investors realise that recession is not imminent. Global shares could still make new lows early in 2019 (much as occurred in 2016) and volatility is likely to remain high but valuations are now improved and reasonable growth and profits should provide decent gains through 2019 helped by more policy stimulus in China and Europe and the Fed having a pause. Emerging markets are likely to outperform if the $US is more constrained. Australian shares are likely to do okay but with returns constrained to around 8% with moderate earnings growth. National capital city house prices are expected to fall another 5% or so this year led again by 10% or so price falls in Sydney and Melbourne on the back of tight credit, rising supply, reduced foreign demand and tax changes under a Labor Government impact. The risk is on the downside. Cash and bank deposits are likely to provide poor returns particulrly if the RBA cuts the official cash rate to 1% by end of 2019. Beyond any further near-term bounce as the Fed moves towards a pause on rate hikes, the $A is likely to fall into the $US0.60s as the gap between the RBA’s cash rate and the US Fed Funds rate will still likely push further into negative territory as the RBA moves to cut rates. Being short the $A remains a good hedge against things going wrong globally.